Hey, have you implemented the NuGet Action Plan? Get on it, it'll take only 5 minutes: NuGet Action Plan - Upgrade to 1.2, Setup Automatic Updates, Get NuGet Package Explorer. NuGet 1.2 is out, so make sure you're set to automatically update! The Backstory: I was thinking since the NuGet .NET package management siteis starting to fill up that I should start looking for gems (no pun intended) in there. You know, really useful stuff that folks might otherwise not find. I'll look for mostly open source projects, ones I think are really useful. I'll look at how they built their NuGet packages, if there's anything interesting about the way the designed the out of the box experience (and anything they could do to make it better) as well as what the package itself does. Json.NET is James Newton-King's excellent library for accessing and working with JSON on .NET. The 4.0 release is cool not only because it's in NuGet, but also because it's currently the best way to deal with JSON data structures on the Windows Phone. Json.NET is notable particularly for James' obsessive focus on performance (check the charts and graphs!) It's also been around FOREVER. I blogged about Json.NET in 2006, in fact. If you open up the Newtonsoft.Json.4.0.1.nupkg using the NuGet Package Explorer (that's a ClickOnce link, son) I can learn a lot about how James has packaged up his library. First, notice now he's got a number of folders under his /lib folder. I talked about this a little with the last NuGet Package of the Week, but James has taken it to the max. Kudos to him! With NuGet, you can have one package that includes versions of assemblies for many different Framework Versions. Check the NuGet documentation on Supporting Multiple .NET Framework Versions and Profiles. James has create a single NuGet package for Json.NET that does the right thing for .NET 2.0, 3.5, 4, SL4, and the Windows Phone 7. Nice. 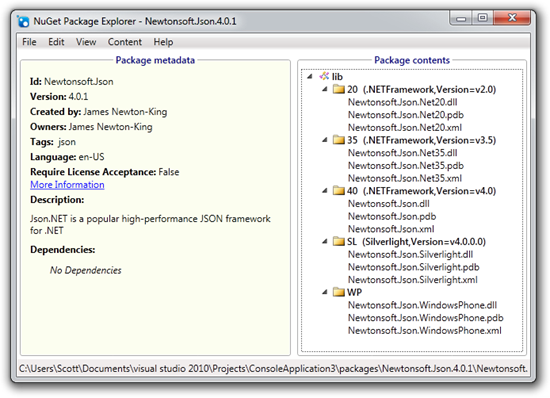 One thing I think James should add is a Newtonsoft.Json.Sample package per David Ebbo's post "Take NuGet to the next level with sample packages." I found myself wondering where to start with Json.NET as there was no sample code included. No worries, to the cloud web! James has amazing documentation on Json.NET on his site. The site also has a simple JSON payload that will give you the correct direct link to the right download for you. I never understood why it was so hard to get a direct download for .NET, so we put it in a basic JSON payload so you could access it programmatically. The SmallestDotNet JSON payload looks like this. It's not very sophisticated, but it is what it is. Now, look at the j variable in this screenshot. How cool is that? There's lots of choices on how you want to consume your JSON with .NET. The new Json.NET is compiled on .NET 4, and includes some really cool dynamic support. From James' blog, see how things used to work, and how the new C#4 dynamic keyword makes working with JSON more fun. This is really an amazing open source library and I encourage you to check it out if you're doing anything at all with JSON, and maybe throw JamesNK a few coins for his efforts. Thanks, James! If you're really interested in ways to consume JSON using C# dynamics, also check out JsonFx 2.0 on GitHub or JsonFx on NuGet! This library is extremely easy to use with dynamics. I came here to say what Stefan said. .NET's built in JSON class can do everything you noted above - so why use something else when the functionality needed is already present in .NET? The built in fuctions don't let you do what JSON.NET lets you do, and by that I mean access JSON as an object or communicate easily with JSON services. If all you want is the ability to call JSON web services or work with JSON without the baggage of a framework or DLL, I made my own JSON library (it's one file), .JSON. I created it so I could easily call JSON-enabled web services like StackOverflow, GitHub, or Envato. You can find it on my GitHub account. It's about 500 lines of code you can drag and drop into your app with only one extra reference, System.Web.Extensions for the serialization/deserialization. If you're going to MIX and the Open Source Fest, you can ask me about it. Stefan and Charlie - The default JSON serializer is much slower than JSON.NET, especially on SL and the phone. What is Hanselman up to? What dastardly plan does he have to compromise our computers? Why does Microsoft's Internet Explorer tell us not to trust his website? "To help protect your security, Internet Explorer has blocked this website from displaying content with security certificate errors. Click here for options..."
Json.NET rocks. I've started using it on Windows Phone 7 apps and it's a dream. One line to deserialize my calls into a full object graph and one line to serialize it back again into Isolated Storage. No more parsing xml! It also has some cool features like being able to write it out to xml if you want. One thing to get when working with JSON is JSONView, an add-on for Firefox. Once installed, any JSON url you browse to is displayed in the browser rather than presenting itself to download to a file. Highly useful when debugging your calls or just seeing what the JSON looks like for something. Someday we'll have the add-on community for IE that FF has. Well, maybe. One more thing. If you're working with reading JSON it's fine to build your own classes but for a large JSON payload try the JSON C# Class Generator from CodePlex. It's not perfect but I find it useful when I'm dealing with having to build the class heirachy to deserialize JSON. I visit the site with Firefox and the JSONView add-on, copy the payload, paste it into the JSON C# Class Generator and usually go in and just strip down the class to it's minimum. Then a single line of code against Json.NET to deserialize the entire graph. Works great! This is a great tool for those of us who are either unable to take advantage of the new dynamic type offered in .NET 4 or wanting the benefits that static typing can provide. The smallestdotnet site is broken in all my browsers. I can't tell if you've got .NET installed. Perhaps you don't have .NET installed or perhaps your browser isn't letting me know. Looks like you're running FireFox. That's totally cool, but if you've got a version of .NET earlier than 3.5 SP1, I can't tell if you've got .NET installed from FireFox. Seem you're totally up to date! You've got a full install of .NET 4.0 on your machine. I can't tell if you've got .NET installed. Perhaps you don't have .NET installed or perhaps your browser isn't letting me know. Consider visiting this site using Internet Explorer, which will tell me more about if your system has .NET on it or not. NB: I have both .NET 3.5 SP1 and .NET 4.0 installed. The Firefox message implies you should be able to detect that. The IE message is totally bizarre - I'm up to date, but you can't tell if I'm up to date, and I should visit in IE??? And what's up with the validation on this form? I've entered my name, email and webpage, but it keeps telling me, "Please enter your OpenId or your Name, Email and Webpage". Richard - It's simple, browsers that aren't IE don't report what version of .NET you have. That IE9 one is a bug I think. Send me your UserAgent? As mentioned on the IE Blog, IE9 will send the short UA string detailed above without pre and post platform registry value tokens. Websites will continue to be able to get the extended UA string with pre and post platform tokens through the navigator.userAgent property. Since I have .NET 3.5 SP1 and .NET 4.0 installed, the message seems to imply that you should be able to detect them from Firefox. Richard - Yes and no. There is an optional Firefox Add-On that some enterprises will install that I can use with Firefox, but maybe 5% of folks have it installed. So shouldn't the message read, "if you haven't installed this add-on (link), I can't tell if you've got .NET installed from FireFox"? Agreed. The code is messy and needs a once over. Same with the message. Scott, thanks so much for this! I was stuck and this helped! Have recently been using the scriptfactory in WCF service to create JSON data / output for consumption with a iphone. Looks like this will be jsut great for dooing the same thing for phone 7. I ran across this JSON project http://fastjson.codeplex.com/ , which claims to be the fastest & smallest parser out there. I haven't given it a look yet, but figured it was worth mentioning. Unlike most of the json libraries out there, we distribute it as a C# source code SimpleJson.cs rather than a .dll file. It will take around 20k for your dll when you add SimpleJson.cs after compilation. It works on .net2.0+ , sl3+ and wp7+. And you can actually enable/disable data contract support. And it works well with dynamic too incase you are using .net 4.